Blogs, stories & comments... aka "Jaguar Prints". "Whatever the image of yourself, it's a mask and it's hiding emptiness." When I was a student learning about energy healing, in a two year course at WhiteWinds Institute, I had recurring dreams whereby I was seeing people with heavy face paint & makeup on. It covered their identity. It happened frequently enough that I asked my teacher about it. He said, "Stan, who are YOU under that mask? Who are you really if you take the mask off?" Just from that inquiry, the dreams stopped. I began to question myself about who or what I was pretending to be in life. I stopped pretending that everything was perfect or that I was ok, or that I was strong, or didn't have any problems... In short I stopped denying my own humanness, began embracing my vulnerabilities, and began to let my guard down. I began to be more real and authentic. This was about 12 years or so ago. 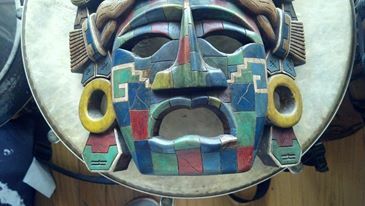 More recently, a mask figure similar to the one above came into my awareness. In deep meditation, I saw a "face" similar to that mask carved onto a mountainside of black rock. The mouth itself was a vast cavernous opening. "I" was minuscule next to it. It was so enormous and dark - and all of the stone, all of the mountain, all of the face itself was black like obsidian - that it frightened me. It neither reflected nor gave off light of any kind. I really thought this was my darkness and karma that was mine to work off, and believed that I was doomed to lifetimes of suffering for my character flaws... my "sins". Again, I consulted with my teacher. He said "That's YOU." Sigh...really? I kinda knew that, but hearing it from him made a positive difference. He offered little else. It was up to me to figure it out. "Go into that darkness, go into the mouth itself. BE with the mystery. I am already the mystery." As Adyashanti mentions above, this is the "emptiness" behind the mask. That constant exploration, that relationship, facing the fears that arise, yet stepping into in anyway, is where I have been for more than a year now. Everything I thought I knew is falling away, and the outer world is reflecting this. And so too, this is happening with many people and the world itself. Everything looks and feels upside down and in turmoil. The earth itself seems to rebelling as it quakes and blows hurricanes at us. Yet it is a great time of old structures and paradigms falling away. It is a time of redefining who and what we are. Most importantly, it is a time of being curious to the emptiness, the mystery, the enormity of who we really are, the love that we really are... and staying present as well as we can within ourselves. There is no wrong way to do it, we just need to be nice to ourselves and each other along the way. Big Love and thanks to you all, I look forward to being with you soon. Over the past two days I have made it a point to disconnect from the world of electronics and many people, for the sake of connecting deeper within my heart and deeper into personal meaning of these Holy Days. It is a singular and solo journey that goes to my childhood roots of relationship with Christ and the Divine. So please know this is about my experience, a spiritual experience, NOT a religious experience according to a book or doctrine or politically driven messages from any other person. There is a church in town that I have come to know and appreciate as being hugely diverse, welcoming of all people regardless of gender identity, color or other religious beliefs. The ministry staff is female dominated and lead by a woman. On Christmas Eve, this church was having an earlier service, a midnight mass, and a Christmas Day service. I opted to go to all three. As soon as I walked into the chapel for the first service, I could feel such a love that overwhelmed me. Several times in the evening, I simply cried as my heart was gushing. There were favorite songs from childhood that we sang…songs I know by heart but struggled to get through because of the tears streaming down my face. There were times – especially while singing – that I could feel a heat in different parts of my body. My third chakra was on fire as something was melting there… some chunk of energetic stagnation that gobs and gums up the way I think. These things cloud my discernment or create false judgments that get projected where judging should NOT be my business ever. Areas behind my heart & heart chakra were cooking sometimes… releasing impurities from this place of genuine and authentic relationships with others and life. And oh my God the Wise Men! A beautiful family from India came and sat in front of me. These turban clad men of the Sikh tradition – yes, three of them along with their wives and a young child – graced us all with their presence in that church. 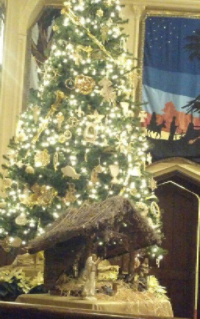 They had randomly picked that church and those seats in front of me, near the decorated tree and the manger scene, to hear an old story of a Holy Child being born, and what that can mean to us in modern times. The significance of this history being replayed right in front of me was beyond words. I was stunned two days ago, and I still am today. To simply sit in the wonder of this is enough. I don’t have to figure anything out. So we have our shortcomings and failures. We try, we give it our all. In the case of Jesus the man who became the Christ, he gave his life. He took a real deep dive into the human experiences of love, heart break, betrayal, torture and death, to come out on the other side with compassion, forgiveness and absolute Unity. I’d say that’s pretty vulnerable. Everything was risked. After the two days of my child-like remembrances and delving into soul nurturing innocence, I felt it was appropriate to round out this journey with humility. I went to where the rubber meets the road. Jesus the man spent time connecting with other human beings who were simply living life. Many were financially challenged, sick, outcast, harshly judged by other parts of society, frowned upon or ignored all together. On Christmas day I found a place to do the same. I was deeply humbled to be of service listening to stories of recovery. I heard – and shared – stories of sickness, confusion and shame. We had coffee, we fed and served each other food. There were women, children, men, homeless and not so homeless, different languages and silence. This was human-ness and compassion in action. Spirit in action, wearing human clothes. We – as a people – were there for each other, and everyone was Christ in this place. The son says “I’m not lost Daddy, I’m right here with YOU.” He had no worries. It was so clear and simple to this child. It should be so clear and simple with all of us, that when we are connecting in clear and healthy ways… compassionately connecting and helping with each other, listening, simply being present without fixing yet sharing in kindness … that no one needs to be or feel lost. This is what we are here for. Whether it is in a yoga class or a homeless shelter, we can genuinely recognize and touch upon that “Namaste” place inside ourselves, inside another human being in their struggles or joys. We can recognize that spark of the Divine and our humanity. I remind myself that there is no difference, it is One and the same. And so it was that I was given, by Spirit, some true Christmas gifts. These gifts speak to me of Life Itself, It’s Love, It’s value and It’s richness. It all resides in me and in YOU. The other day was challenging for me. I spent most of my morning trying to get motivated and moving. I was distracted, feeling down and gloomy. As a seeming reflection of my insides, the clouds were pouring rain outside. A time or two I simply sat with the funk of my feelings. I needed to get to where I could at least NAME what I was feeling. When I could simply name and feel the sadness, I stayed with it, actually going into it. Tears came. I wept. It didn’t last long, but it was enough to instigate further movement on my part. I decided to go to the tobacco… I took the loose leaf tobacco and held it in my hands to say prayers in the First Nation’s way, as taught to me by a good friend and Native Elder. I prayed for guidance, for the healing medicine to come – in whatever way that looked like; I prayed for forgiveness; I prayed for guidance and grace…Aho. Then I rolled & smoked it, sending my prayers out to the Universe knowing they were heard and I was seen by Spirit. The continued movement for me came when the rains stopped. It was chilly out, and damp in the air, but I needed to run. Not only to clear my lungs from the smoke, but also to simply move. It had been way too long since a good run happened for me, so off I went. My route isn’t huge, but it’s pretty great for me, with hills for an occasional challenge, and woods. I really. needed. the woods. They called to me so I answered. After a good twenty minutes of trotting to get there…ahhh, I entered the woods to walk and listen into that space. When I had gotten about 70 yards into my patch of forest, I squatted down. I put a hand on a bare and exposed tree root, and wept. Not the short-lived weeping from earlier in my apartment. But I wept. Sobbing. At first I didn’t know why, nor did I have to know. I simply went inward to the feeling, into the energy and emotion itself, and let the tears come. A few moments go by while I weep. I feel the streams of tears mingle with the sweat, and its running down my face, chin, dripping into the red clay dirt. Then I begin to feel more of what the tears are about. It’s a mixture of mourning sadness, grief, anxiety, stress build up, feeling stupid, and “why did I do that?” kind of angst. Most of it was mine… I claim my emotions and what I feel. Some of it is not mine, because as an empath, I notice more & more of a ‘collective’ kind of emotion these days. I cried tears for the end of a relationship, loneliness, as well as tears for connection with others; tears of disappointment; tears for my finances and career stresses; tears for social events like Standing Rock; tears for my daughter growing up; tears for breaks and breaches within my family… its like the civil war, where brothers are on opposite sides of the fence shooting each other; I cried tears of helplessness and hopelessness; tears of fear and terror in not knowing what to do next. I cried tears of actually feeling a Unity with God...a oneness... a loss of self... a death of self. More tears came with no labels…they just came, and I wept… Like wringing out the last bit of moisture from a soaking wet rag. After that last bit, a dog came. She sat by me, smiled a dog’s smile, closed her eyes as I pet her. She was letting me know I was ok. Life is happening, all is ok. I thanked her generously with rubs, petting, kisses on the head, and a little hug. With no fanfare, she caught up with her human, who was gracious enough to say nothing and let me be in the moment. With no fanfare, I took a few deeper breaths of relief, feeling clarity, feeling at peace with the sadness, yet so much more spaciousness inside instead of contraction. The medicine worked. The prayers were answered. Spirit came to love & assure me, as a dog with more grace and forgiveness than I could bring for myself. Ever. I moved onward in the rest of my run home. Why do I feel? Why do I weep? Because I hurt. Because I care; I give a damn unapologetically; and Because this is how much I Love. What Can Happen in a Healing Session? During a couple of sessions just this past week, I was really struck by the significance of the energy work. There is an effortlessness that happens in correlation to the trust and openness with the Higher Intelligence of Spirit at hand. In the course of an individual session, there is a three-way conversation that is happening between the Divine Higher Intelligence, the client, and me the practitioner (or any other well experienced practitioner) . The client’s job is to relax & allow. My job is to do the same while also staying present, heart centered, trusting and open to the flow of the healing energies. Divinity knows what to do. Two clients presented themselves with intense low back pains. Both scored their pains at 8 out of 10… 10 being most intense. 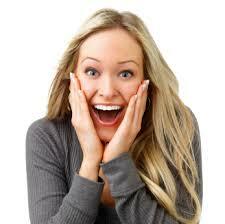 Upon completion of the sessions, one client scored his pain down to a 1 or two. The other client scored her pain as completely gone, at zero. During the sessions, starting from the outside of the energy field and moving inward, the healing energies work to bring balance, grounding, clarity & a return of vitality to the whole being. As this happens, stagnated & sluggish energies that cause disruptions – in the chakras, the mental field, the emotional field, and the physical tissues – are cleared out. Healing frequencies and vital Life Force energies flood those areas of pain to reduce inflammation, restore optimum balance and health. Sometimes an emotional release can be a component of the clearing process. “Stuck” areas of energy can be moved, and, at times it is most healing and very important that an old “stuck” bit of emotional memory be cleared by giving it expression. This is the recognizing and honoring of our humanness rather than spiritually bypassing it. We are here in this existence to have certain experiences, and our emotions are a vital part of our lives. With the two clients mentioned here, there was an access to healing energies which are of absolute Source Energy. (By the way, we all have access to this.) This is energy that is before time, before “stories”, before traumas. Thus, there was an easier and graceful transformation of unhealthy energies throughout the body, and there were easy releases that were more physical. There were multiple muscle twitches, softening of tight tissues, unwinding of organs, fascia, and opening of the dural tube of the spinal cord. This absolute Source Energy is Love, and it seeks to reclaim all of itself. It seeks to restore health and wholeness within itSelf by restoring it in YOU. A tremendous amount of change can happen in the course of one energy session, AND greater success consistently occurs with follow ups. An important component of each session is what you learn for your own energy management, healing, self empowerment, and access to the healing Source energies that are present and available to you. I do invite you to join me for a private healing session, as well as the group Medicine Wheel sessions that happen monthly. Together, let’s see what Love has in store for you. If you know or suspect that you are empathic, or feel easily overwhelmed when you go out in public, i.e. to the grocery store, this MAY describe you. In those moments when you feel out of sorts, disconnected, or scattered, are you aware of what is energetically going on? Do you know how to figure it out? If you do figure it out, do you know what to do? There can be times in the day or in the week when we may begin to feel “off” and we aren’t fully present with ourselves or other people. When this happens, I begin to check in with myself. I may really need some time to do some self care, take a break, and eat healthy foods. I also begin to check my energy field to see if there are excess energies that are clinging on. They just don’t belong to me. With the use of an easy kinesiology technique, I start to ask simple yes/no questions to gain clarity as to what is present – or not – and regain more of my own presence. I will quickly go through the entire sphere of my being and ask/ check for five possibilities. Only three out of these five are of “outside” energies. ALL should be considered very simply and with NON-JUDGMENT. (1)	Attachments, living or past… this is about other people’s energies, who may be deceased or still living. For example, if I had an argument with my sister, am I still attached to her and that whole situation? If so, it is probably draining me. (2)	Entities… this is about something of nearly a non-consciousness kind of energy. A thought form, from either myself or someone else, can be a type of entity. It is rather gray, amorphic, and barely has form. (3)	Demonics… yes, this is a detrimental energy in that it is a clear drain on the system. Still, deal with this in a NON-JUDMENTAL way. Invoke Archangel Michael to take care of this and move on. It needs to be kept that simple. It is neither “good” nor “bad”, and A. Michael knows what to do with it, knows where to take it, knows what the Divine Will is with this energy. I/ you/ we do not. (4)	Aspect… an aspect of myself is a component of me that is fractured off from the core. My aspect is that part of me that has a childhood conclusion, i.e. 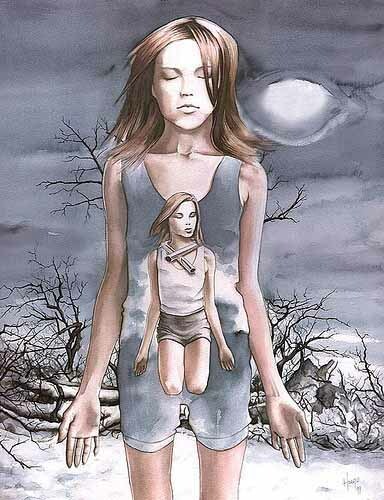 “I’m not enough… something is wrong with me.” An aspect will hang out in the field, in the vicinity of the mental body. Even though this is “me”, it is not in the present moment, yet it is a VERY important part of the wholeness and vitality that NEEDS TO BE RECLAIMED. (5)	Grounding… is there connection to the earth? Am I present in my body? Is it weakened? If there is weakness, why & where is that happening? Especially with these last two issues, this is where further investigation and energy healing takes place as these are explored with an experienced practitioner. 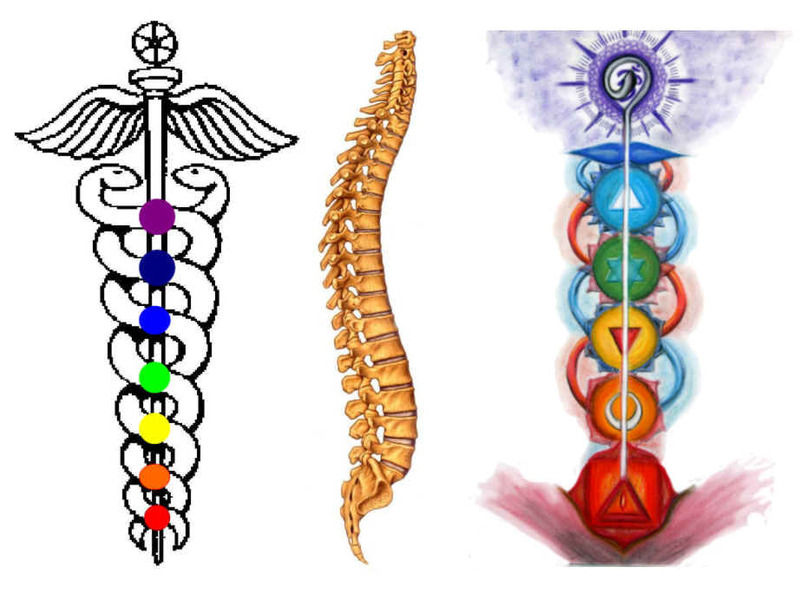 There are many areas in the field as a whole to explore through the chakras, in the body itself, checking different organs, unwinding the spine & central nervous system, on & on. It is always a brilliant idea to have help with these, as sometimes we just need the extra support and guidance. YOU are an amazing Being with multi layers, facets and hidden treasures! Life needs all of you and Love seeks to reclaim itself. That would be you. Come see me my friends, lets work together for greater wholeness and presence in the world, and YOUR self empowerment in learning how to do these things with ease and clarity. 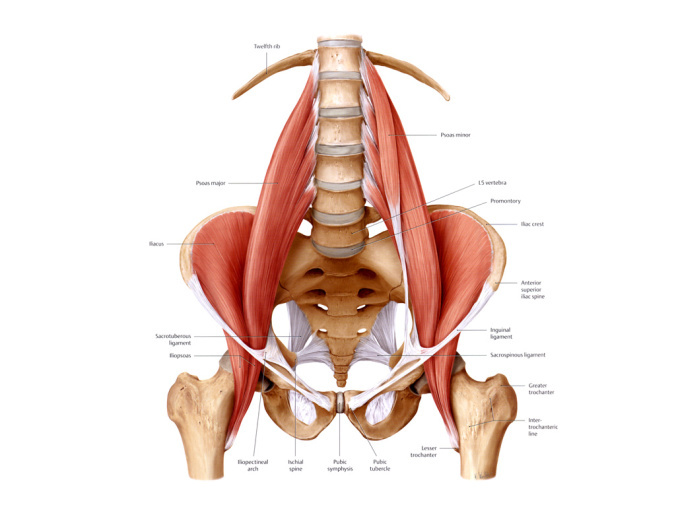 This article - by Brett Wilbanks - about the psoas muscle comes from Waking Times. I found it to be so relevant that I simply had to share it. "A tight psoas not only creates structural problems, it constricts the organs, puts pressure on nerves, interferes with the movement of fluids, and impairs diaphragmatic breathing. In fact, “The psoas is so intimately involved in such basic physical and emotional reactions, that a chronically tightened psoas continually signals your body that you’re in danger, eventually exhausting the adrenal glands and depleting the immune system.” "
Whether you have this area of your body addressed energetically or physically, it's gonna do your body good. From my perspective as an energetic practitioner, when I see that the energy of this critical muscle is "off" or out of place, it really affects grounding, causes energetic imbalances, can cause fear & anxieties, and can adversely affect other areas/ chakras of the body higher up. Click on the link below to read the complete artice. This is about more than simple chakra alignment and the usual “clearing”. This is about a deep thoroughness. Let’s start with energy awareness and management. Are you aware of your own chakras? Are you aware of the optimum size that your chakras should be? Do you know how much stuff/ clutter you may be carrying around in there? And for your own sake, have you cleared out all the “teachers” and detrimental influences from your chakras? These teachers… people we learned from in our childhood… are often our greatest source of trouble and repeating patterns of living that just don’t work, they keep us stuck, we repeat behaviors and thought processes. If we use the third chakra as an example, we can see how important it is to clean house, clear the slate, and have a better existence in life…. The third chakra is where “I give myself the right to know myself Authentically.” Yet as a child growing up, we draw our conclusions/ beliefs/thoughts about ourselves, life, and other people around us FROM our parents, immediate family and other close influences. Being aware of exactly what those thoughts/ beliefs are goes a long way with introducing new thought and ways of existing in the world. AND the truest self empowerment comes from claiming responsibility for being the student. I am the one who was the student. I was the one who came to those conclusions, I empower myself as the one who can see the falsehood, therefore I begin to know myself Authentically. I begin to see and understand my TRUE NATURE. BUT, if the energetic signature of those teachers are not cleared out, often times those influence still come right back. All of them need to cleaned and cleared out from root chakra to crown. We can begin to BE (at the root chakra) our true selves, we can FEEL (at the 2nd chakra) the emotions in their purity – this is to feel them separate from the story, and feel our emotions in their fullness. With practice and developing greater awareness, we can also really begin to tell what are "my" emotions, vs emotional clutter that we may unknowingly be carrying from someone else. We can remember and learn to LOVE (at the 4th chakra) and be loved Authentically rather than conditionally or according to constrictions of stories & conclusions. Can you see how this goes, and how important it is? A real cleaning needs to happen for the freedom of the Love that is your own Soul. It is YOUR true essence. Love is who you are my friends. Claim it. Greetings! I usually write about events and healings that happen when working on clients, and use those incidents as examples of how healing can happen for you too. Today, I’ll share more about myself, my own processes, struggles and healings. You may recognize yourself. Also, I want to acknowledge that as a healer today, I did not come into the world seeking to be a healer. I learned to do what I do by: (1) realizing in my mid 30’s that I had some deep healing work to do on myself; (2) I actively sought out help and teachers to heal myself; (3) The wanting to share with others came from what I learned, and came after two years of extensive training. This training is ongoing today so as to continue personal, spiritual growth, integrity and honesty. Very few healers have “arrived” to a completed state or place of being, where all is perfect in their world or they are untouched by events. “Stuff” still comes up and triggers still happen. Healers need fellow healers. Teachers need fellow teachers. This is the way that growth and progress continues. My most influential teacher has been Dr. Fernand Poulin of WhiteWinds Institute of Integrative Energetic Medicine. I am grateful to be a graduate of Dr. Poulin’s two year program, and always glad to jump back into his workshop experiences, healing circles and occasional graduate classes. Also, just recently, I had the privilege of spending a month in a healing and learning environment with Janet Raftis and Elicia Miller. They presented a program at HeartSpace Atlanta called Emotional Healing and Your Inner Intuitive. It was an honor to be in what I affectionately call “The Women’s Lodge” with these healers and other women there for healing and learning. There was something about really being immersed in this pool of feminine energy that was deeply needed. It is an honoring of one’s emotions, rather than shutting them off, that leads to greater intuition and forward movement. Back in late January and February, I was in a place of stagnation. Total non-movement, feeling uninspired, uncreative, and more down than up. Some of this was seasonal related with more clouds than sun, shorter days, and the overall – natural but not functional – wanting to hibernate. The BIGGEST reason for my “down” time is really about what most people know as a lost inner child. I have come to know this part of myself as an aspect. This is the same as one’s inner child that was rejected, traumatized, criticized, and has a belief system that is run amok with “I’m not good enough, not loved/ lovable, something’s wrong with me, I don’t fit/ belong here” etc etc. I prefer “aspect” here because – while it is related to child/ childhood – there is nothing lost about any component of me. There is no part of me that has gone anywhere, and this aspect/ component/ facet of myself is vitally important. My aliveness is there, my creativity, my joy, my fun and desire for life. There is all kinds of STORY that could be told about this from childhood, sometimes teen years, and the same repeated messages that work like hypnosis. While those messages may start as actual words or actions from other people (such as family members), the continued message really comes from within. The continued detrimental beliefs, dialogue and hypnosis continues from within one’s own mindset. Especially when this happens at earlier ages, when the young mind is very sponge-like, it can set in deeper in the psyche, as well as within the physical tissues of the body somewhere. Our body feels and reflects it physically in some way or another, and the emotions are felt (also in the body) due to the detrimental beliefs. Our behaviors in life can reflect this as well. Using myself as the example, this comes out as procrastination, avoidance, sometimes hiding/ withdrawing, playing small or “poor me”… and doing anything/ all things possible to avoid looking stupid or weak to others. I may misunderstand something that someone has shown or told me. An old habit of mine was to stay quiet rather than ask questions. I would pretend to understand when I really did not. This was really bad for me in some math classes in grade school. And I wasn’t stupid; I just couldn’t bring myself to ask for clarification. Sooo… how to work this out of the system? What is the healing? In the simplest words possible, stay Present. Allow. Feel. Listen. Be connected to the heart, even if that doesn’t make sense. In the moments of deep angst, when there is something I am supposed to do, a task that I am responsible for, yet I can’t seem to make headway, can’t seem to make myself move and take appropriate actions… I simply have to be present with where I am at. For example, feeling the physical and anxious tensions in the body… where is this happening? Upper torso, especially left side, some chest/ lung area, some of it right in the solar plexus area. As I bring my hands to touch & actually hold these parts of my body, I feel the emotions come to the surface. Memories come flooding up. Emotions intensify and I let myself simply cry without controlling anything. THIS is staying Present and Allowing. THIS is acknowledgment and acceptance of where I am and what I am experiencing. Somewhere in the course of allowing, I contact and touch the center of my chest to be heart connected. THIS is where the most healing takes place. The aspect of me that believes the conclusions/ hypnosis/ old story says “my heart is so broken”. The Heart clearly, steadfastly, and compassionately says “I’ve never been broken, and I am not broken now”. These words are not only heard, but they are felt. Deep in the chest and in the torso as well, there is a tangible change that happens as the voice of the hypnotized aspect suddenly stops. The tears and emotions change. In staying present to the change, in staying heart connected, there is a felt return of this aspect of myself, my aliveness, my wanting of Life itself. NOW this is real engagement. The energy of the aspect itself had been literally covering up my left lung (grief lives in the lungs) and hovering over my heart to protect it in the only way it knew how… from a child’s mind & perspective. Yet with the arrest of the pattern/ belief structure, from the place of authentic compassion and genuine truth of pure Being – yes this resides in every heart – everything changes. The physiology (the way the body/ tissues holds itself) the emotionality, the psychological detrimental dialogue and chatter all changes and ceases. I can take a deeper breath, and my body wants to hold itself straighter & stronger. Anxiety falls away, the procrastinating behavior diminishes and adult needs are met. Work can be done. The aspect, which was from a childhood place, now very quickly matures and lends itself to the function of the total/ whole/ unwounded Spirit. So, does all this mean that it won’t happen again? Probably not, BUT all the signs can be recognized. Detrimental patterns and behaviors can be warded off, even arrested before they begin. The recognition of “Oh, this is up, let me pay attention here… my very essence is telling me something” certainly leads to greater self care and nurturing, as well as brings us to greater presence and grounding. Intuition can even increase with this, as NOW there is an honoring of the senses, the body cues, recognizing thoughts with compassion rather than controlling to “shut up”, which isn’t very nice. With compassion, there is genuine engagement of all of our humanness, rather than circumventing it, skipping the emotions and scrambling to get to “the happy place”. The point of power in all this is the heart AND the present moment. This greater present moment is accessed quickly by the heart, which knows ONLY, the present moment. They are intricately and intimately intertwined as long as you have a beat in there, as long as breath moves in & out of your lungs. Connect with your own heart today. Happy New Year, Happy New You, everyday is a New Day! Not too long ago someone came to see me just because she was curious, and was able to take advantage of a good timing opportunity. She came in saying "There's nothing really wrong, I don't physically hurt, I'm not emotionally distraught, I just want to see what you do." Perfect! I'm thinkin'... "oh boy, here we go. This is gonna flop, with nothing to really work on." So, in a situation like this - and really in any situation with any client - my job is to see what wants to be seen/ recognized, to stay heart centered. 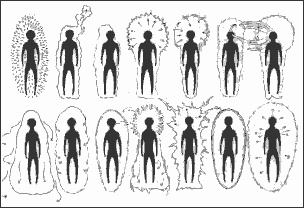 I am curious as to what shows up in the energy field or elsewhere in body. While sitting and listening to her words, as well as listening into the silence, my attention was drawn to her left side as something began to reveal itself. In giving voice to this, I explained to her that the left is about the feminine, her as a woman, there can be lingering "mother issues" in the field, sister, grandmother, female co-workers, etc. She was adamant that there were no issues, nothing was "wrong"... in fact she felt really happy! I - and this particular energy happening in the moment - was adament that we listen and pay attention. While compassionately being with her in that, allowing for space and a few moments of silence, something remarkable happened. From within this space came a clear realization for her... and really it was a big surprise... that she simply loved her best friend, who was another woman. The innocence & depth of this relationship, the trust & kindness over the years, and how significant that is, was rising to the surface for "Lucy". (name changed to protect privacy). "Oh... its right in front of me!" she said with tears in her eyes. "She's been my best friend for so long... and I didnt really know how much I loved her, until now!" It was dawning upon her for the first time, about how special and significant this relationship was in her life. It opened up a new level of gratitude, appreciation, and love for "Lucy". It was certainly the Best Surprise. I am so humbled at the way that energy healing works, humbled at the innate intelligence of the body and the energies that are being accessed, and certainly humbled in being the facilitator with a client. In a recent session with a new client, I took note of areas of her field and chakras that were distorted, also noting which chakras were needing attention. For “Liz” (name changed for privacy protection) they all wanted a tune up, but the ones that were showing a need for awareness the most were 2nd and 5th chakras… the seat of emotions in the belly area, and the place of giving voice in the throat, mouth, jaw area. Working from the outside inward towards the physical body, some excess energy that just wasn’t hers was cleared out. This always makes for greater clarity throughout the session. Next, I was drawn to begin working the jaw/ temporomandibular joint. “Liz” revealed to me that she had recently had a dental procedure done, and her jaw was still a bit sore. The REALLY amazing thing she shared with me was that while I was energetically working there, her lower left abdomen – and much of her digestive tract in that area – simply relaxed significantly. Through much of the session, from that point onward, there was audible digestive and energetic movement through the guts, aka the emotional/ 2nd chakra region. At one point I was drawn to touch/ bring awareness to the left pelvic bowl & hip area, yet this turned out to be the key place that allowed the right side to unwind. Who knew? Things really began to shift dynamically when I was drawn to the lines of energy called the Ida & Pingala. These are major nadi or energy lines that originate from the legs, then intertwine around the spine in a criss crossing fashion. See the images attached to this article. 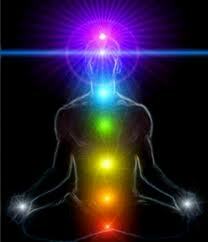 It was the Pingala energy – originating from the right leg, that was sluggish at the throat chakra. As I stayed present with this sluggishness at the throat, “Liz” began to give voice & expression to traumas from earlier in her life, as caused by a male figure. After a few moments here, attention was brought to the heart and lungs. Lungs tend to hold grief… and while the heart may feel “broken” at times, it is also the place where innate compassion resides. Holding space and allowing for this to really come forward in Liz’s being was deeply healing and restoring. She said more than once that “it felt like a healing balm was spreading through my body”. Thank you for reading along with me, my friends! I hope that you will connect with me to explore what a session may be like for you. The Holiday seasons are upon us, the New Year is on the way. 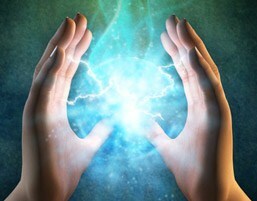 If you need stress relief, a “tune up”, or you are simply curious about energy healing, please reach out to me. I am at your service. Much Love, and Merry Christmas!